WASHINGTON (CNS) -- Forty Catholic institutions, including the Belgian bishops' conference and a leading church social welfare agency in South Africa, have decided to divest from fossil fuel companies. The organizations cited the call of Pope Francis in his 2015 encyclical, "Laudato Si', on Care for Our Common Home," to take steps to protect the environment as well as the importance of making investments that lead to a carbon-neutral economy in an effort to address climate change. The Oct. 3 announcement came as the monthlong "Season of Creation" ended and the church prepared to observe the feast of St. Francis of Assisi the next day. "What is clear is that momentum in fossil fuel divestment is growing a lot. This is a very concrete sign of the voice of the Catholic community," said Tomas Insua, executive director of the Global Catholic Climate Movement, which organized the effort following a divestment conference in Rome earlier this year. "These 40 institutions are taking the moral stand and are sending a very clear message to governments and the fossil fuel industry that their business model is not aligned with a health climate and a sustainable society," Insua told Catholic News Service. To date approximately $5 trillion has been divested from fossil fuel companies by organizations around the world. ivestment from fossil fuels is one way to "look at how one applies the teachings" of "Laudato Si'," said Kevin Roussel, executive director of Catholic Welfare and Development in the Archdiocese of Cape Town, South Africa. We're finding a lot of people exactly in the same place (of wanting to divest). They're not just sure about the how, not whether they should. 'We definitely are telling others in our journey (of implementing the encyclical)," Roussel told CNS. "We're finding a lot of people exactly in the same place (of wanting to divest). They're not just sure about the how, not whether they should. What we're doing is sharing in the how we're doing it. That's quite a big step." "Considering the spate of environment degradation and pollution, it is but fitting that we invest our time, energy and resources into transforming society to a better place where humans can comfortably exist," said Anthony Aiah Senesie, national coordinator of the Sierra Leone Young Christian Student Movement. "For far too long, our activities have created a serious damage to our common home through use of dangerous substances that have the potential to undermine human existence and we must therefore shout and walk the talk in enhancing an environmentally friendly society for us and children's children," he said. An official of the Bank for the Church and Caritas in Paderborn, Germany, said the institution felt "strongly responsible to participate in tackling the issue of climate change." "We seek to commit ourselves publicly to divest from investments which deal with the highly polluting fossil fuels coal, tar sand and oil shale, and encourage other Catholic investors to join the divestment coalition," said Tommy Piemonte, sustainability research officer at the Catholic bank. Sister Mary Deane, congregational leader of the Presentation sisters in Ireland, said the religious order hoped to divest from fossil fuel companies within five years. "We further commit ourselves to exploring how our investments can promote sustainable solutions to the current climate change crisis," she said. In Italy's Diocese of Assisi-Nocera Umbra-Gualdo Tadino, Archbishop Domenico Sorrentino explained that divestment was following the example of St. Francis of Assisi in his love for creation. "With the aim to promote an integral ecology in which 'everything is interconnected,' the church that hears 'both the cry of the earth and the cry of the poor' cannot stay indifferent in front of the catastrophic consequences of climate change that are unfairly affecting poor and vulnerable communities," the archbishop said. "We want to act to overcome an economic and energy system that is damaging too much of our common home," he added. "The care of creation requires unity, commitment, sharing and prayer." CORRECTION, Oct. 10: This story initially reported that these 40 Catholic institutions had divested approximately $5 trillion from fossil fuel companies. In fact, that is the total amount divested by companies around the world. 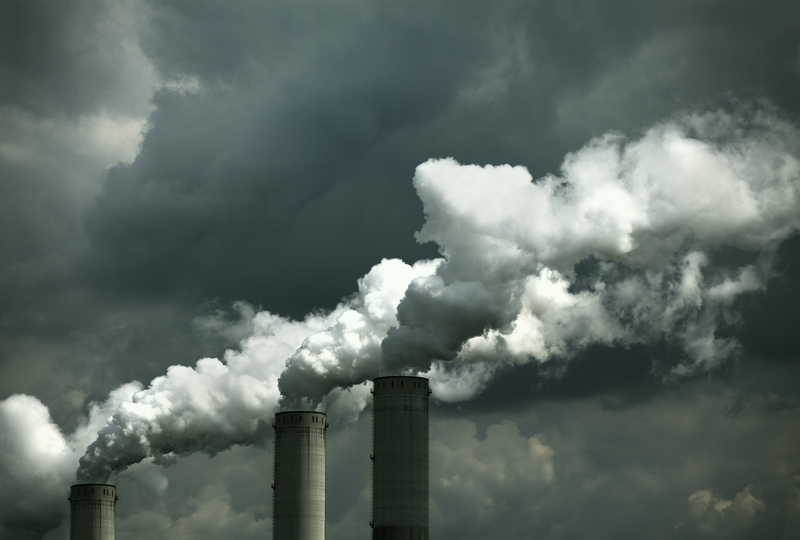 Those smokestacks, obviously shown for their shock effect, are emitting water vapor. CO2 is in there, too. CO2 is an invisible gas, making it easier for wishful thinkers to ignore.